Ever been on a Segway? Ever wished you had? 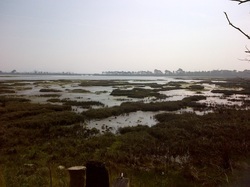 Then Dorset Segway Tours at Upton Country Park near Poole could be “just the thing” for you! What’s more, even if you haven’t and the whole idea of these futuristic, two-wheeled electric transport devices leaves you cold, there’s a fair chance that taking a Segway Tour of the park and gardens of this Georgian mansion might just change your view in more ways than one. At several thousand pounds a pop, buying a Segway is out of the price bracket of all but those with very deep pockets for their hobbies or a serious business application that the Segway can fulfil. 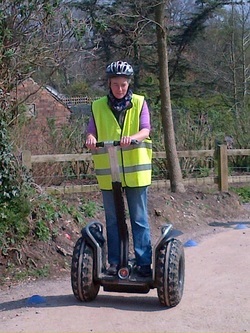 But if you just want a little taster, and a huge amount of fun, Segway rental by the hour may be the option for you. An ideal special treat for friends and family, prices per person per hour start at around £30 (more at weekends). For this you get hire of the Segway, safety kit if you haven’t brought your own (a cycle helmet is required) and all the training you’ll need to be unleashed on the paths of Upton Park. Before you start you have to do the standard stuff, like sign the waiver that says you know that Segways can be dangerous - the man who originally bought the UK Segway rights died when his own went over a cliff. That said the route you’ll be taking has none of those, but it does have enough other minor hazards and obstacles to keep life interesting! There are age and weight restrictions for users - so check the terms and conditions before you book or set off. Booking is definitely recommended as weather and demand for places could leave you disappointed. Broadly speaking, if you are under 12 years old and/or lighter than 7 stone or weigh more than 18, you won’t be allowed to ride for your own safety. Driving or riding a Segway is very easy once you know how and once you get used to it. They are incredibly manoeuvrable and go much faster than you think. Balance is key, but you’ll pick up the basics faster than you learned to ride a bike. Five or ten minutes on the training circuit performing the basic moves, functions and essential procedures and you’ll be ready to head out into Upton Country Park with your designated group guide. Take it steady and don’t get over confident. You’re about to embark on a circuit of the gardens, parkland, woodland paths and track-ways of this amazing location. Your confidence will grow as you whiz effortlessly through some wonderful scenery, but stick to the rules handed down by your guide or there’s a good chance your new electric steed will buck you off or bite you in the backside! It’s difficult to overstate just how much fun gliding almost, but not quite, silently through the countryside about a foot off the ground (well both feet off the ground - but you get the picture) is. It really does have a futuristic, almost Star Wars or Star Trek, feel about it. And whilst you may begin the tour with trepidation, you’ll finish it grinning from ear to ear and wishing you could go round again. 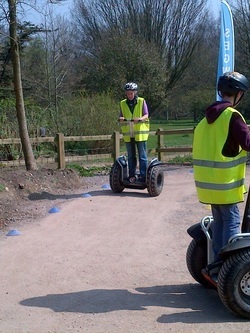 Segways, or at least the ones you’ll be using, have a top speed of about 15 mph. They can turn on their own axis (a bit like an ice-skater’s spin) and they can go up an down hills that you wouldn’t think they could. And all this on an electric motor that you can’t see, can barely hear and leaves no trail of exhaust fumes. It really is a fun way to enjoy the countryside. 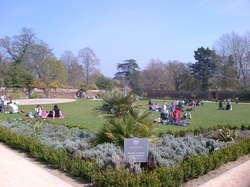 And when you’re done, why not take coffee and cake in the Café up at the House and enjoy the rest of what the park and gardens have to offer! Driving or riding a Segway is very easy once you know how and once you get used to it. They are incredibly manoeuvrable and go much faster than you think. Balance is key, but you’ll pick up the basics faster than you learned to ride a bike.....​"